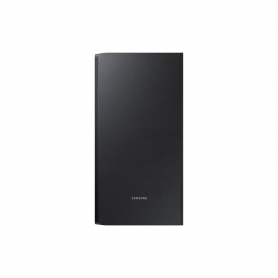 Samsung’s HW_K850XU comes in black, with a sleek, minimal design to suit any modern living space. 24 bit sampling means that this soundbar can preserve the quality and detail of your audio, giving better sound quality than you’d hear on a CD when listening to lossless file formats (.wav, .flac, .alac or .aiff files). Three tweeters – these generate crisp, clear high notes. Six mid-range drivers – for warm and lifelike mid-range frequencies. 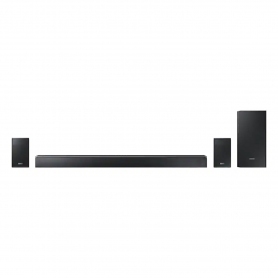 This model also comes with a pair of rear speakers and a subwoofer, all of which are wireless. Enjoy deep, rich bass and immersive surround sound. As these speakers are wireless, you can position them anywhere in your set up, for the best possible results. 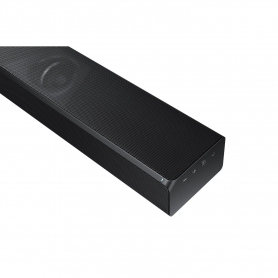 Dolby Atmos also features on this Samsung soundbar, making audio sound even more lifelike and natural. This feature creates a 3D sound field, putting you at the centre of the option while object-based sounds move around you. Feel like a part of the action with high-quality Dolby surround sound. Wide-range tweeters on this model give better sound coverage across a larger area. 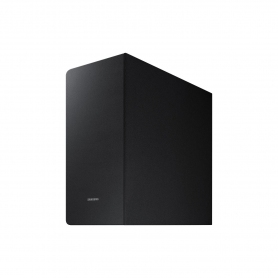 No more sitting in a ‘sweet spot’ to get the best surround sound – the HW_K850XU gives multi-layered, detailed sound across the whole room. Whatever you’re listening to, enjoy it at its very best with the HW_K850XU. Seamlessly connect your soundbar with an UHD Blu-Ray player and SUHD TV to experience 4K content at its absolute best. The HW_K850XU features 4K Pass-Through, so you can play UHD-quality films and shows with 3.1.2 channel surround sound. This model can also be connected wirelessly to Samsung Multiroom speakers. Enjoy top quality audio from anywhere in your home. Samsung’s HW_K850XU offers full surround sound, and can play music with studio quality. Order yours today.